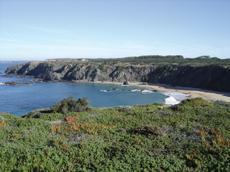 This is a 7 nights and 8 days cycling holiday in Alentejo in rural Portugal. The first and last nights are spent in Vila Nova Milfontes and and there are stop overs in Zambujeira do Mar, Aljezur, Monchique, Santa Clara and Odemira. Bed & Breakfast is provided on all nights, and the firsts nights meal is also included. You will stay in small guesthouses, which are quite intimate and will bring you into contact with many local people. All rooms have private shower/bathrooms and are kept spotlessly clean. The cycling on the tour is graded as Easy - Moderate, as the vast majority of the trip is on tarmac lanes and minor roads with very little traffic. Just 3 or 4km are on well-made gravel tracks. It is quite hilly with the largest ascent of 500m on day 4 but distances are short and there is no rush. The maximum distance on any stage is 39km. Bike Hire is included in price and Helmets are also provided if required.